This year’s legislative session began with bipartisan energy for helping reform special-education funding and policy in Washington state. But as the session deadline nears, a key bill that sought to improve teaching and help parents navigate the often bewildering and complex special-education system died quietly last week — though advocates hope there’s a chance to get these ideas attached to a budget bill still at play. The news set back parents and lawmakers who argue that boosting funding for special education is not enough to turn the tide on a system that’s produced one of the nation’s highest dropout rates for students with disabilities. “In the scheme of education policy, these are small asks,” said Beth Sigall, a special-education parent advocate and founder of the Eastside Education Network. Sigall, among other advocates, pushed for the passage of Senate Bill 5532, a policy measure that made it all the way to the House Appropriations Committee before it was left to fester past a key deadline. When training general-education teachers, school districts must include lessons on teaching students with different needs and abilities. State money to make sure families can get help from advocates in meetings about student progress and program eligibility. Establishing certain schools as “demonstration sites” to help educators learn about inclusion. More than one-third of students who receive special-education services dropped out of school during the 2014-15 academic year, according to a report from the Department of Education. And even though most students here don’t have severe cognitive challenges, a KING-5 story first reported, less than 20% special-education students met goals on state standardized tests last school year. 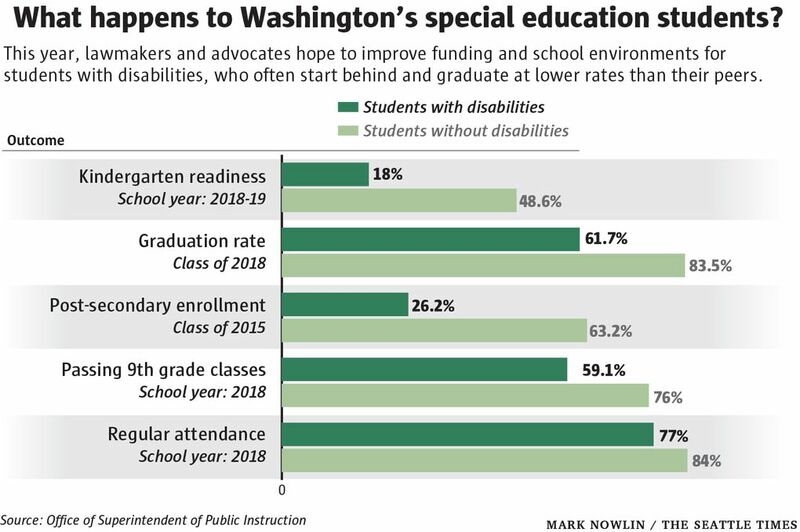 Washington also segregates students with disabilities from general-education classrooms more often than other states, a practice experts say contributes to low outcomes. It’s unclear why the seemingly popular bill died. Lawmakers often pick which bills to focus on in meetings that are off-limits to the public. House Majority Leader Rep. Pat Sullivan, D-Covington, had one reason: He said funding was the only piece of the special-education puzzle the committee had time to consider this year. “That doesn’t mean that we don’t care deeply about the policy,” said Sullivan. With time running out, lawmakers and advocates hope they can revive their proposals as amendments to another bill that’s still in play amid the ongoing, closed-door budget negotiations, which are already contending with an overhaul of the state’s mental-health system and a possible capital-gains tax. One avenue they can try: the Senate’s special-education funding bill, which the House Appropriations Committee amended and passed. That proposal could add more than $100 million over two years to cover school districts’ costs for special services and resurrects an idea from an early state Education Department proposal to give districts that do a better job including students with disabilities in general-education classrooms more money. It awaits a floor vote in the House. Since that bill is necessary for budget negotiations, lawmakers have until the end of the session — April 28 — to determine its fate. It’s hard to get school districts to improve, said Rep. Gerry Pollet, D-Seattle, if a bill that provides training on inclusion can’t make it to the finish line. “I’m not going to hang my hat on that in public, because I just don’t know if we can succeed [this year],” said Pollet. A spokeswoman for Sen. Lisa Wellman, D-Mercer Island, the primary sponsor of the Senate’s special-education funding bill, said last week that Wellman was looking into ways she could adopt portions of the policy bill. Its primary sponsor, Sen. John Braun, R-Centralia, said he would remain optimistic as long as he sees a path before deadline. So is Sigall, an education-policy attorney who’s been a special-education advocate since her oldest son received his autism diagnosis more than a decade ago.